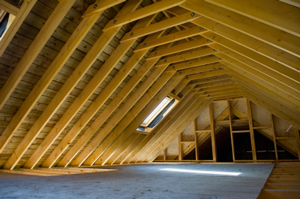 In most houses, the attic is the top priority for an insulation upgrade. This makes sense when you consider that in a typical house, wintertime heat loss is greatest through the attic space because of inadequate insulation and excessive air leakage. Also, it’s often easier to add insulation to an unfinished attic than to add it elsewhere in the house. If you’re aiming to upgrade the insulation value in your attic, it would be hard to find a better type of insulation than loose-fill cellulose, which is also referred to as cellulose attic insulation or blow-in cellulose. There are several different types of cellulose insulation, but they’re all made the same way –by processing waste newspaper and other paper products. Grinding equipment turns the paper into a fluffy material with an R-value of up to 3.8 per in. Treatment with a natural borate compound provides the insulation with high fire resistance as well as resistance to mold and insect infestation. Cellulose is one of the "greenest" insulation materials available. It’s much less energy-intensive to manufacture than fiberglass insulation, and doesn’t pose the same irritation potential in terms of handling or inhalation. However, installers always need to wear proper dust masks when installing the material. Cellulose can be installed over existing insulation providing the insulation is in good condition. A typical attic insulation upgrade with blow-in cellulose can be completed in less than a day. It’s important to complete certain prep work before the new insulation is installed. The attic should be air-sealed to reduce the amount of conditioned air that can leak up into the attic from the living space below. Baffles may need to be installed around recessed lights that extend into the attic space. Different baffles are installed between rafters at the edge of the roof, extending up above the planned level of the new insulation. These baffles help to maintain proper ventilation between the soffit vents and ridge or gable-end vents. Finally, access must be provided to HVAC system air handlers that are located in the attic. Workers usually install "dams" around this equipment so that it won’t be covered by new insulation and inaccessible for servicing. Our contractors services the Connecticut, New Haven, Hartford, Norwalk, Waterbury, Stamford, New Britain, West Hartford, Bristol, Danbury areas as well as surrounding Connecticut towns. Call 1-888-370-6924 or contact us online to schedule a Free Estimate.